One year of random activity with the goal of 32point5. Just wanted to pop in and say Hi and give a few updates. I had super fun on Saturday night with the girls. Much food, beverages, giggling and dance floor stalkers! The running plan is going along nicely. All this month I only missed yesterday, but did my 5 K run tonight instead. I'm on a training course at work this week which means working 8 to 4 and traffic....grrrr!! I have finished and hung my fly away home quilt, pictures to follow shortly. I've already started working on another quilt. Not much else is new except for the GREAT possibility of going away in May with some friends. We're contemplating Punta Cana (I love it, Punta Cana sounds like a dirty word for lady parts)! Anyhow, does anyone have any recommendations for somewhere warm you have gone to and enjoyed? 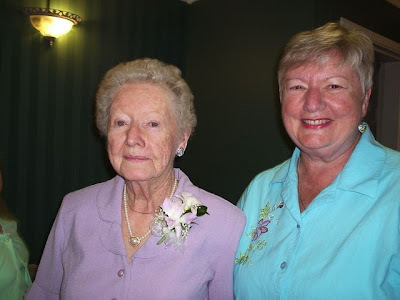 Joining the WWW in your 90's? Uh huh, I do loves me some corn bread! Corn bread can be a tricky monster. I find most that I come across are hard, dry as a rock and really bland. This is light, moist but crumbly and sweet. 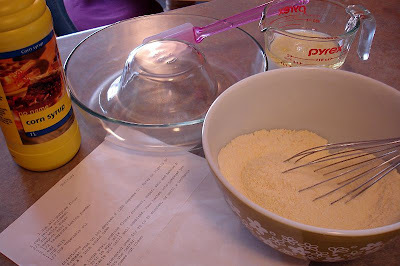 I've been making this for a few years now; I found it at All Recipes it's called Golden Sweet Cornbread. It has over 827 reviews so you know it's amazing! 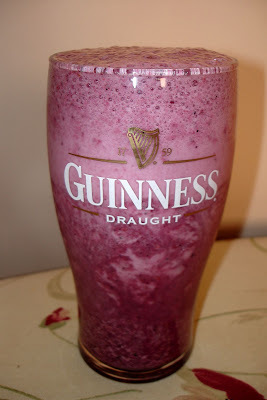 I have linked the recipe here. The only extra thing I do, is after 20 minutes of baking, I take it out of the oven and drizzle corn syrup over the top and then pop it back in the oven for the final 5 minutes. The corn syrup leaves a nice crunchy sweet crust. 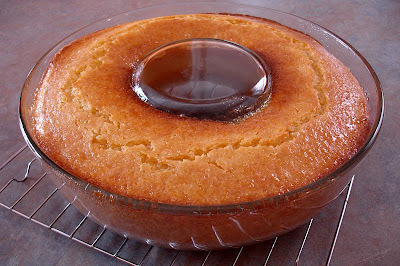 I always make it in the bundt pan but I bet it would make amazing muffins. Fail proof, easy recipe. 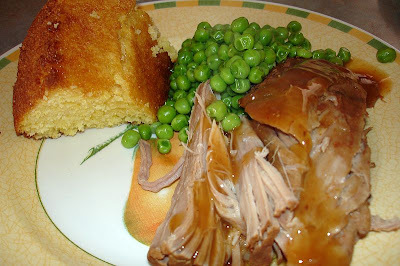 We had the corn bread for lunch today with amazing pulled pork that I started in the crock pot last night. Good stuff! Finally, my Nana has just bought herself a laptop and has joined the world wide web. See even at over 90 you're never too old to learn something new. Rumour has it she snuck out during installation because she had a card game to attend. If you knew my Nana this is so her. The day she got her pace-maker she was spitting mad because she missed a game. We're into the third week of March 2009 and things are starting to liven up outside with a little over a solid 12 hours of sunlight! I checked on my herb garden on the weekend and my Oregano and Thyme are already perking up! 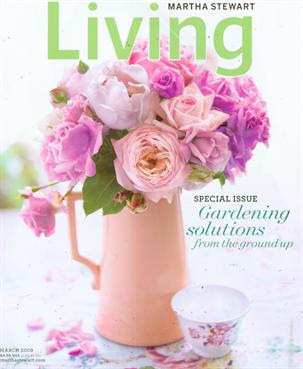 As I had previously stated I'm going to quantify my Martha Stewart Living subscription by using one article every month. I've been super busy, so I cheated with the easiest article I could find. 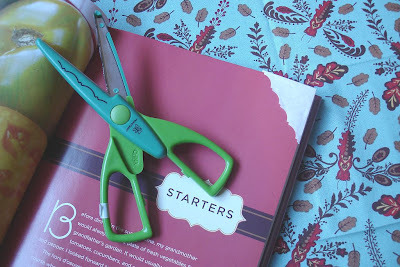 "Good Things" on page 50 suggests using an envelope and scrolled scissors to make a page saver. Click here for the instructions from Martha's website. See super easy! The book is The Comfort Table written by Katie Lee Joel. Ugh, she is so pretty! I only wish I could be casually elegant like her. I love in the foreword written by Paula Deen she states "I don't trust a skinny cook!". Hilarious, but secretly I think true as well. Lastly, I thought I should give an update on the 32point5 plan. I've stopped being lazy and have been inspired by the amazing progress by my friends Donny, Maggie and Tara I'm back to the 5K treadmill every other day. I'm warming up for 10 minutes and then alternating between running and walking. This week is 6 minutes of running broken by 2 minutes of fast walking. My goal is 10 minutes broken by 2 minutes. I have been reading a well written blog called Trying for a Tri that has fantastic exercise and diet tips. I made the shake above with some Whey Powder that I picked up at the bulk barn. I find that I eat relatively healthy however I don't think that I get enough protein. Let's see if it will help. Off to work, see you soon! Ahhh, Daylight Savings started today; this always cheers me up! It means that spring is just around the corner and for someone like me who permanently works the afternoon shift it's the possibility of a glimmer of light on the usual dark drive home. I met up with a group of girlfriends the other weekend for some dinner and drinks. I made the burp cloths above for one of them who was due the next week. This is her third child with a total of 5 when you include her step-children AND a full time job. Bless her little soul, she constantly has energy. 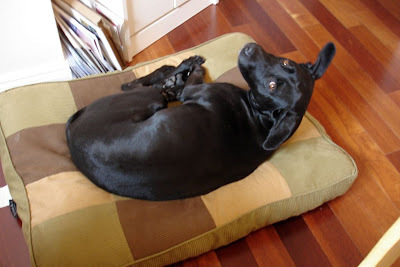 Man, I have a dog and a husband and I'm pooped most of the time...I need some of her mo-jo! I have finished quilting and attached the binding to the front of my "Fly Away Home" quilt. All that's left is to hand-sew the binding to the back, wash, add a hanging sleeve and I'll be done. 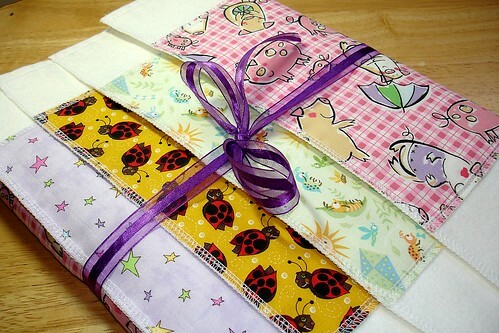 The backing fabric was also used on my Niece's quilt in New Zealand that I sent to her when she was born. Her parents are expecting their second child in just a few months. As usual my trusty helper was with me all afternoon. Mum and Dad, there's your pile of mail waiting for you when you get back from Florida! Enjoy the extra hour of Sunshine today, I know I will. 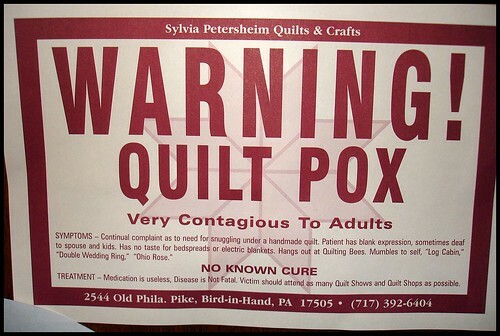 Saturday was my friend Quilting Newbies birthday. 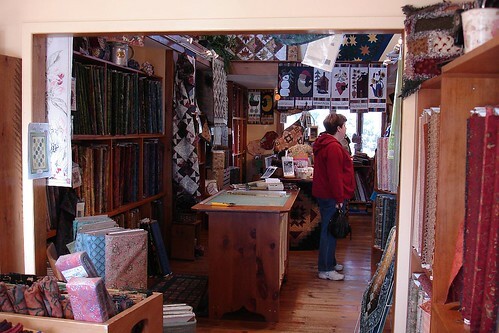 To celebrate we went on a Quilt Shop-hop and some lunch in Uxbridge, Ontario. This sign was on the back of the bathroom door in one of the stores. I found it both comical and true. Just look at the birthday girl below, surrounded by fabric with that crazy look in her eyes! Our first stop was to Sew Many Fabrics. The store is nice and bright and had a lot of finished samples displayed showing many different techniques. They had a Long Arm machine on display, I so want one of these. Hmm, where could I find about $5,000.00? 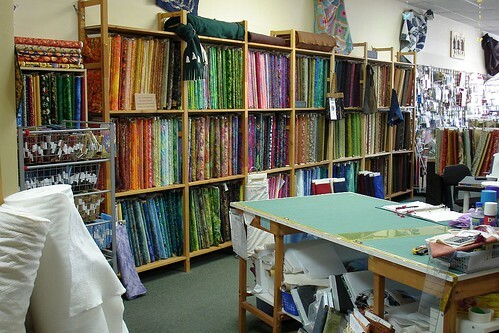 Next stop was Quilters Cupboard. I love, love, love this store. It's very easy to miss since the store is out of a converted house and only has a small sign on the front lawn. Thank goodness for Garmin's, without this I would be perpetually lost and never leave the house. 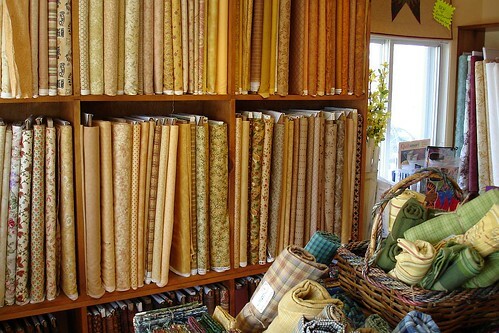 They have a beautiful selection of fabrics, notions, patterns. Again many samples are located throughout the store and all the ladies are so very helpful. 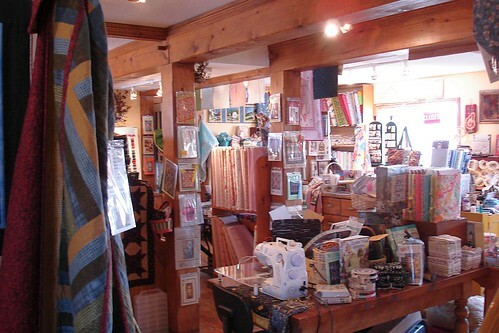 There is a great flow to the the store ranging from children's, flannel, seasonal, and classic to modern fabric choices. They offer a 20% discount for your birthday; and according to my bill, it looks like this discount also applies to friends shopping with you! For lunch we went to frankie's ristorante. I'm always nervous to eat out with Quilting Newbie since she has some serious food allergies. I was trying to find a nice place to eat and frankie's is 100% gluten-free & nut free Mediterranean cuisine. Lunch was FANTASTIC! 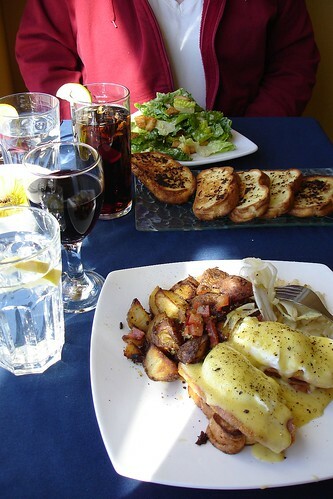 Mmmm, I had Eggs Benedict while Newbie had a Caesar Salad and Garlic Bread. The bread was made with rice flour; the texture was so light and fluffy, yummy! 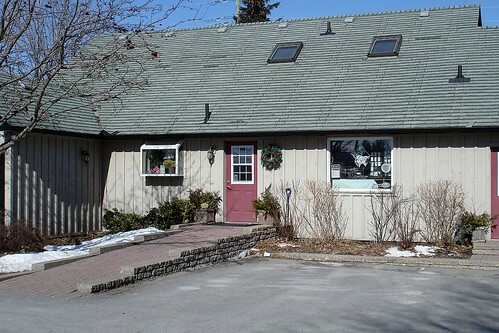 The restaurant is very pretty with great service and very fair prices. I will definitely go back. These were my fabric purchases for the day. 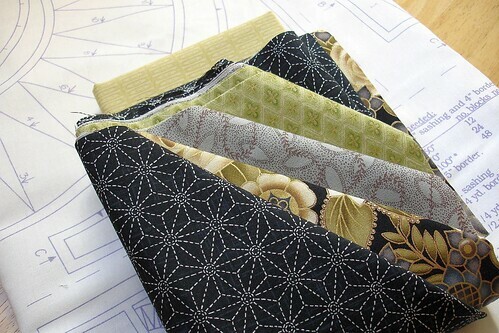 I'm stocking up on greys, blacks and greens for my next quilt. I also bought this fabric panel that has New York Beauties for "paper piecing". It was a great weekend finished off with this Chicken Orzo for dinner. No pictures but the Big Man described it as "Blog Worthy"! 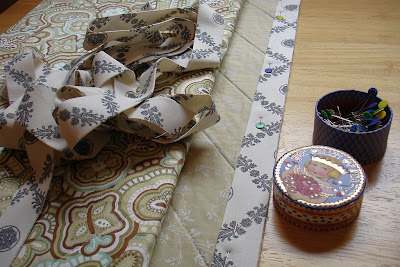 I love creating handmade quilts from my Spare Room -- Being a "Quilter' makes up a big part of "Who I Am"
If you want to leave a comment about a particular entry, just place your cursor over the word "comments" at the end of that journal entry. When you click on the "comments" a new page will open. You can then type your comments and choose an identity "dot". Most of you will pick "name/URL".